There appears to be conflicting advice over whether heating milk will reduce its B12 content. Vitamin B12 is stable at room temperature and therefore does not need to be refrigerated. It is not destroyed by cooking. Vitamin B12 resists breakdown even at boiling point of water for several hours. Prolonged cooking, including boiling of cow's milk, destroys B12. Similarly, about 70% of B-12 is still present after cow's milk is boiled for 2-5 minutes. 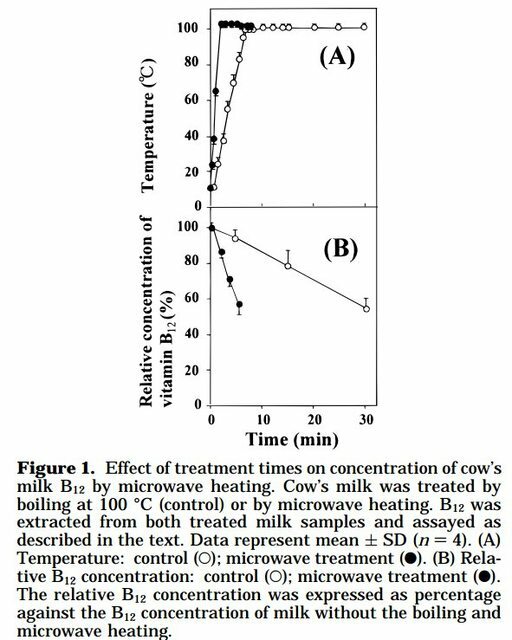 Does boiling of milk reduce its B12 content? Many studies show the evolution of vitamin in milk while heating. You may even compare heating methods. In this article, the evolution of B12 vitamin is drawn (figure 1). However, the loss of vitamin that occurs while heating the milk up to 100°C is only around 10% of the total B12 vitamin. Prolongated heating will really lower the concentration though. Not the answer you're looking for? Browse other questions tagged healthcare milk vitamins . Does eating Vitamin C and drinking green tea helps to counteract the effects of secondhand smoke?